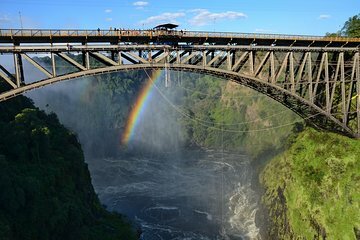 Experience Africa's biggest adrenaline rush with this bungee jumping, bridge swing or biplane adventure at the Victoria Falls Bridge. Take a dive into open air surrounded by epic landscapes, rushing waterfalls and the roaring Zambezi River. It's the thrill of a lifetime and it only takes place here! This thrilling Victoria Falls experience is perfect for thrill-seeking adventurers who want to have one of of Africa's most-adrenaline pumping experiences. Book your activity and choice of time, then collect your voucher from the Shearwater Town Office a few minutes away from most hotels. Make your way to the bridge on the day of your activity (bring a passport for a bridge ticket) either on foot or by taxi. You'll check in at the Bridge Cafe and go through safety briefings and paperwork before taking the dive over the roaring Zambezi. You'll have the chance to watch footage of this incredible experience back at the cafe, and even purchase a DVD if you're interested! Voucher holders get complimentary return bus service from Shearwater Cafe at 10 am or 2 pm.